With the clock ticking down on your chance to win the tradetrucks.com.au DAF XF105 prime mover, who better to give a verdict on the truck than a bloke who has notched up almost a quarter of a million kilometres in one over the past year. Wally Cox is a previous winner of the Australian Trucking Association’s Craig Roseneder Award for technical and maintenance excellence. 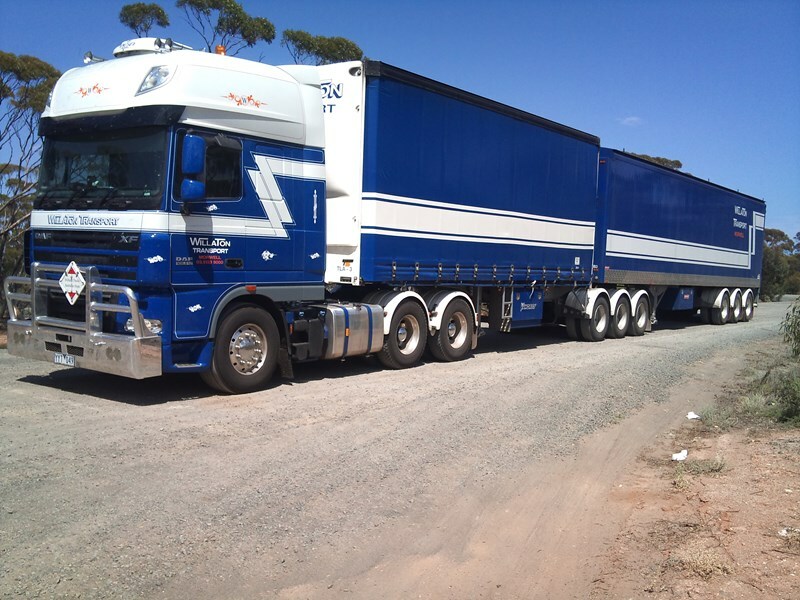 As a driver, Cox has just notched up 12 months in an XF105 running "the paddock", pulling a B-double across to WA for Willaton Transport of Morwell in Victoria. The DAF has clocked up 240,000 kilometres during the year – still on the original drive tyres. Cox says the 510 horsepower (375kW) unit pulls up to 68 tonnes without any problems at all; is rarely rounded up, even when battling the notorious paddock headwinds; and climbs the hills fine. "If I had 600 horsepower I might be quicker getting to the top, but who cares?" Cox says. "It doesn’t matter about being the first bloke there; it’s a matter of being there every week." Service intervals have been 80,000km using Conoco synthetic oil. As for fuel economy, Cox says the DAF has averaged more than 58 litres per 100km since the beginning, and he estimates that about 60 per cent of the time the gross weight would have been in the 62-68 tonne range. He says the 16-speed ZF AS-Tronic automated manual transmission is "programmed to perfection". However it wasn’t all peaches and cream when Cox first climbed into the DAF, and he’s had to do a fair bit of "Wallyspec" to it. "The locker boxes have huge doors but the hole is too small, and the doors took considerable effort to close," Cox says. "The headlights were crap, and I actually stopped because I thought the right-hand low beam was out," he adds. "The lights were so poorly adjusted that it took two nights to get reasonable lighting. With a bit of tampering I achieved all high beam lights operating together." Cox says at first the steering was "exceptionally heavy" for low speed manoeuvring. "Eventually a new pump was fitted and while I feel steering is on the heavy side, it is now acceptable," he says. "The wide profile steer tyres rolled for 180,000 k’s before new ones were fitted." Also in the early days the heater needed constant adjustment, but the thermostat has been raised 10 degrees. Fuel capacity has been increased with a 200 litre auxiliary tank on top of the chassis, giving a useable capacity of 1000 litres. For more observations on the DAF XF105 check out the next issue of ATN and Owner//Driver. Don’t forget to click here for your free entry into the draw to win a DAF XF105!